Grandma's Knitting Place: Been A Very Busy Knitter and Crocheter !!! This is my new favourite baby sweater pattern! To learn how to do small circumferences on two circulars go to www.knittinghelp.com and click on Advanced Techniques to watch a video - this is how I learned - this site is fantastic for learning different techniques - I can highly recommend it and I do - often! and sweet little hat ( my design ) to match and oh joy, I made little booties to match too! Another standby favourite of mine - the Garter Yoke Cardi - free on Ravelry and top down, therefore seamless! - sleeves done on two circulars or dpns. 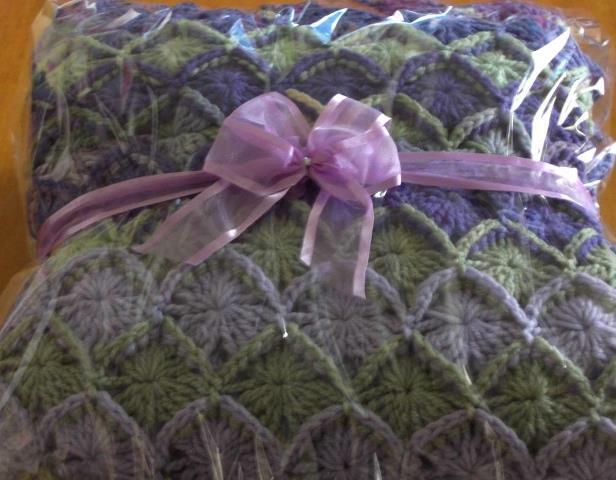 This blanket is Baby's Quick Ripple which I made to fit a king single bed - or to use as a snuggle throw - it is part of a multi draw raffle to raise funds for Huntington's Disease Queensland. Tickets are $2.00 each!!! The three prizes are: $350 Photographic bundle from Curless Photography, Toowoomba, the blanket pictured here, and a $50 voucher from Grand Central Shopping Centre, Toowoomba. The raffle will be drawn 31st August - proceeds will go towards another Fund Raiser - a Sumptuous High Tea at Highfields Tavern, Toowoomba, on September 8th - between 2- 4 pm - but more on this later! More to come - lots of pics to upload yet!